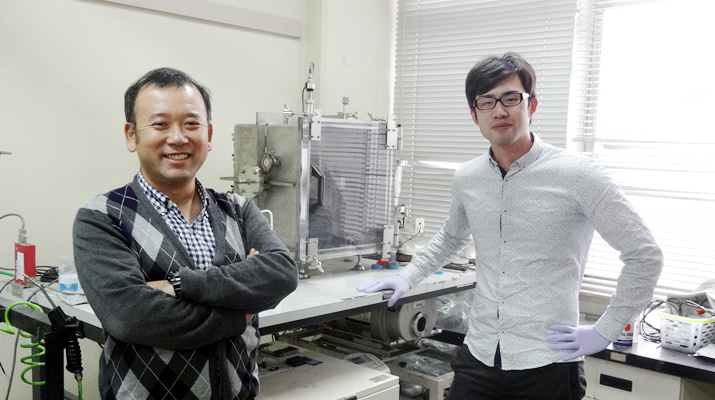 A research group led by Associate Professor Ryoji Inada have successfully fabricated a lithium trivanadate (LVO) cathode thick film on a garnet-type oxide solid electrolyte using the aerosol deposition method. The LVO cathode thick-film fabricated on the solid electrolyte performed well, achieving a capacity of up to 300 mAh/g for both reversible charge and discharge, as well as a good cycling stability at 100 ºC. This finding may contribute to the realization of highly safe and chemically stable oxide-based all-solid-state lithium batteries. Rechargeable lithium-ion batteries (LiBs) have been widely utilized globally as a power source for mobile electronic devices such as smart phones, tablets, and laptop computers because of their high-energy density and good cycling performance. Recently, the development of middle- and large-scale LiBs has been accelerated for use in automotive propulsion and stationary load-leveling for intermittent power generation from solar or wind energy. However, a larger battery size causes more serious safety issues in LIBs; one of the main reasons is the increased amount of flammable organic liquid electrolytes. The research results were reported in Materials on September 1st, 2018. Fig.1 SEM image of a fractured cross-sectional surface of the LVO electrode fabricated on LLZTO garnet by AD. Corresponding elementary mapping for V, La, and Zr is also shown. 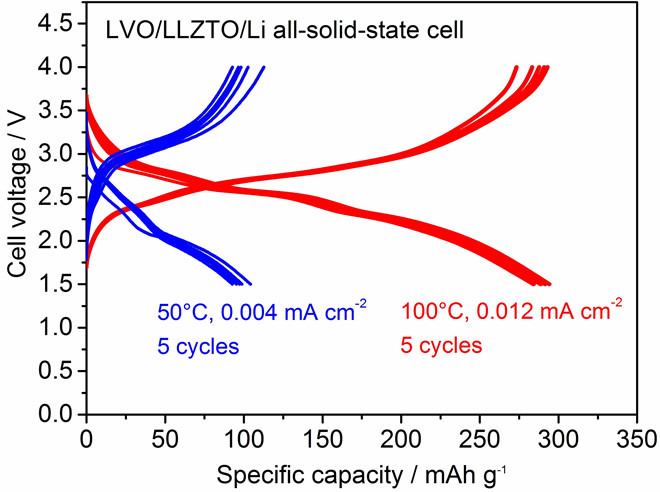 All-solid-state LiBs with nonflammable inorganic Li-ion (Li+) conductors as solid electrolytes (SE) are expected to be the next generation of energy storage devices because of their high energy density, safety, and reliability. The SE materials must have not only high lithium-ion conductivity at room temperature, but also deformability and chemical stability. Oxide-based SE materials have a relatively low conductivity and poor deformability compared to sulfide-based ones; however, they have other advantages such as chemical stability and ease of handling. The garnet-type fast Li+ conducting oxide, Li7-xLa3Zr2-xTaxO12 (x = 0.4-0.5, LLZTO), is considered as a good candidate for SE because of its good ionic conductiivity and high electrochemical stability. However, high-temperature sintering at 1000-1200 ºC is generally needed for densification, and this temperature is too high to suppress undesired side effects at the interface between the SE and the majority of electrode materials. Therefore, there are currently few options when it comes to electrode materials that can be used for solid-state batteries with garnet-type SEs developed by the co-sintering process. 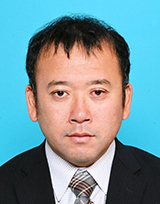 Ryoji Inada and his colleagues at the Department of Electrical and Electronic Information Engineering, Toyohashi University of Technology, succeeded in fabricating a lithium trivanadate (LiV3O8, LVO) thick-film cathode on garnet-type LLZTO by means of the aerosol deposition (AD) method. All-solid-state cell samples were prepared and tested using the fabricated composite. The AD method is known to be a room-temperature film-fabrication process, which uses the impact-consolidation of ceramic particles onto a substrate. By controlling the particle size and morphology, dense ceramic thick films can be fabricated on various substrates without thermal treatment. This feature is attractive in the fabrication of oxide-based solid-state batteries because various electrode active materials can be selected and formed on SE without the need for thermal treatment. Fig.2 Comparison of the galvanostatic charge and discharge curves for the LVO/LLZTO/Li solid-state cell at 50 and 100 ºC. The measurements at each temperature are repeated for five cycles. 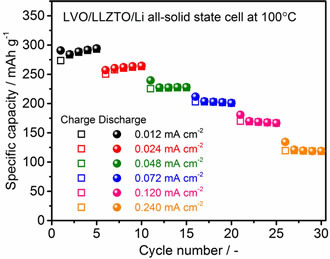 LVO has been studied at length as a cathode material for Li-based batteries because of its large Li+ storage capacity of approximately 300 mAh/g. 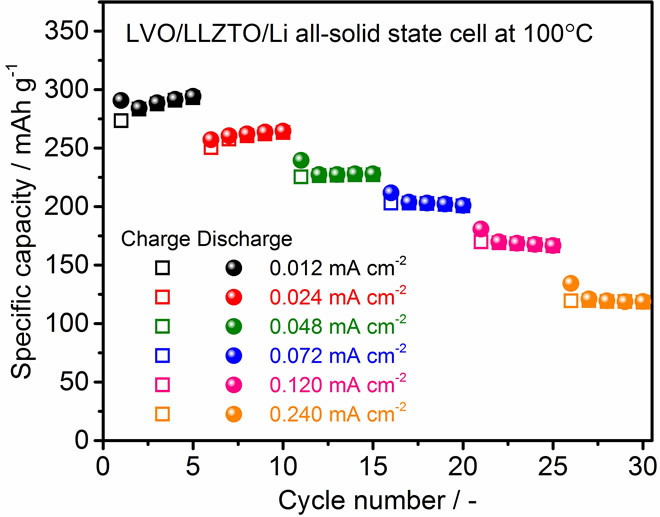 However, the feasibility of LVO as a cathode for solid-state batteries has not yet been investigated. The reaction of LVO initiates at the discharging (i.e., Li+ insertion) process, which differs from that of other conventional cathode materials of LiBs such as LiCoO2, LiMn2O4, and LiFePO4. Therefore, graphite anodes, which are widely used in current LiBs, are difficult to use in batteries with LVO cathodes. In solid-state batteries with garnet-type SEs, Li metal electrodes may potentially be used as anodes; thus, LVO would become an attractive candidate for high-capacity cathodes. To fabricate a dense LVO film on an LLZTO pellet, the size of the LVO particles was controlled by ball-milling. As a result, an LVO thick film with a thickness of 5-6 µm was successfully fabricated on LLZTO at room temperature. The relative density of the LVO thick film was approximately 85%. 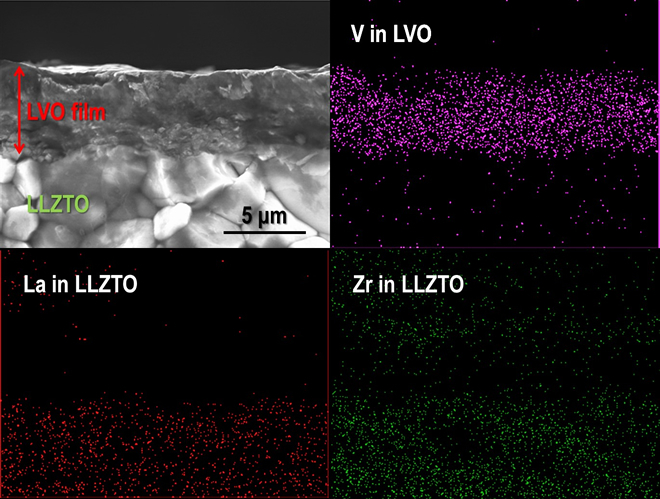 For the electrochemical characterization of the LVO thick film as a cathode, Li metal foil was attached on the opposite end face of the LLZTO pellet as an anode to form an LVO/LLZTO/Li structured solid-state cell. The galvanostatic charge (Li+ extraction from LVO) and discharge (Li+ insertion into LVO) properties in an LVO/LLZTO/Li all-solid-state cell were measured at 50 and 100 ºC. Fig.3 Cycling performance for the LVO/LLZTO/Li solid-state cell at 100 ºC and different current densities from 0.015 to 0.240 mA/cm2. Although the polarization was considerably high at 50 ºC, a reversible capacity of approximately 100 mAh/g was confirmed. With an increase in temperature to 100 ºC, the polarization reduced and the capacity increased significantly to 300 mAh/g at an averaged cell voltage of approximately 2.5 V; this is a typical behavior of an LVO electrode observed in an organic liquid electrolyte. In addition, we confirm that the charge and discharge reactions in the solid-state cell are stably cycled at various current densities. This can be attributed to the strong adhesion between the LVO film fabricated via impact consolidation and the LLZTO and LVO particles in the film. These results indicate that LVO can potentially be used as a high-capacity cathode in an oxide-based solid-state battery with high safety and chemical stability, even though additional investigation is needed to enhance the performance. Researchers have carried out further studies to realize oxide-based solid-state batteries at lower operating temperatures. This work was partly supported by Grant-in-Aids for Scientific Research (C) (Grant No. 16K06218) and Fund for the Promotion of Joint International Research (Fostering Joint International Research) (Grant No. 16KK0127) from the Japan Society for the Promotion of Science (JSPS). Ryoji Inada, Kohei Okuno, Shunsuke Kito, Tomohiro Tojo and Yoji Sakurai (2018). Properties of Lithium Trivanadate Film Electrode Formed on Garnet-type Oxide Solid Electrolyte by Aerosol Deposition, Materials 11(9), 1570, 2018.